“It’s absolutely unbelievable what happens here over the Twelfth period”. You might think those were the words of an indignant nationalist or Catholic, fed up to the back teeth with the 3,000+ Orange marches that are held here every year, not to mention the bonfires and drinking and tricolour-burning that form a backdrop to all this. But that’s not the source. The words were those of a unionist woman ringing into The Stephen Nolan Show this morning, angrily demanding to know why the British army wasn’t brought in last night to protect the unionist people of Belfast who were celebrating their heritage? The BBC reports that last night a car was set on fire and sent trundling towards police lines, a shotgun discharged injuring three police officers and that in toto there were twenty-seven police officers injured. Sinn Fein’s Gerry Kelly was on the Nolan Show condemning the rioters, as was Ruth Patterson of the DUP. What no one confronted head-on was the backdrop to these clashes. If every year you have around nine months of marching, culminating in the lighting of giant bonfires, hundreds of marches by thousands of flag-waving unionists, fiery speeches condemning nationalism, republicanism and Catholicism - if you have all that, is it any wonder that some young republicans/nationalists/Catholics lose the run of themselves? 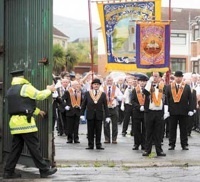 The Orange Order is, in its history and its constitution, an anti-Catholic organisation. That’s why it was founded, that’s why it continues to exist, that’s why, for example, it opposes the visit to Britain of Pope Benedict next September. We could of course pretend it’s not anti-Catholic, that it’s just a happy family outing one day a year, that it’s an Orangefest which all can enjoy. We could, but it’d be childish to do so. Closing our eyes won’t make the monster go away or turn into a cuddly Orange rabbit. I don’t always agree with Fionnuala O’Connor but on ‘Inside Politics’ today on BBC Radio Ulster, she made a point that should be made more loudly and more often. The reason it isn’t is because the BBC doesn’t much like this kind of point. The ideal commentator on our airwaves (and that means BBC Radio Ulster - there is no other radio outlet for political discussion) is someone who (i) assumes there are two (and only two) sides to political difference here; and (ii) is so even-handed, it’s barely possible to tell which foot they kick with. The BBC calls it balance; the rest of us call it bland. So anyway, Fionnuala stepped briefly outside that pretty pretence today, with her comment. She was talking about Orange Order marches and she noted that unionists often drew parallels between their culture (Orange marches) and nationalist culture (GAA games), arguing that the latter is subject to controls that the former aren’t. Fionnuala noted that the parallel is a false one, for the very good reason that GAA games don’t get played along the road. That’s the key point. All this you-attack-our-Orange-Hall-your-GAA-club-gets-burnt-down talk is pure pig-swill. Yes, the GAA play Amhran na bhFian before games and fly the tricolour - but they do it inside GAA grounds. Any marching is confined to a circuit of the pitch before throw-in. The Orange Order insists on getting onto the roads and streets that are supposed to be shared spaces and marching, forcing everyone to make way until they’re done. You’re in a hurry somewhere? Tough - just wait until we’ve finished marching, and notice we’ve police here to see you do. In addition, the Order likes to seek out roads where they’re far from welcome, like the Ormeau Road or the Garvaghy Road. GAA games are confined to nationalist areas. Can you begin to see that there’s maybe a teensy bit of difference between the ‘two sides’ in this case? Good. Well done, Fionnuala.